Submitted by Fred on Fri, 08/16/2013 - 9:35pm. 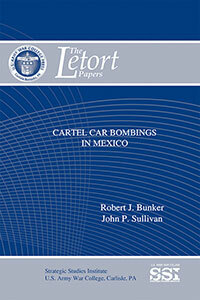 Contemporary Mexican cartel use of car bombs began in mid-July 2010 and has since escalated. Given the proximity to the United States, some literally within miles of the border, the car bombings, with about 20 incidents identified over the last 2 1/2 years, should be of interest to local, state, and federal U.S. law enforcement, the U.S. Army, and other governmental institutions which are providing increasing support to Mexican federal agencies. An historical overview and analysis of cartel car bomb use in Mexico provides context, insights, and lessons learned stemming from the Medellin and Cali cartel car bombing campaigns. In order to generate insights into future cartel car bombings in Mexico, the identification of such potentials offers a glimpse into cartel “enemy intent,” a possible form of actionable strategic intelligence. For Mexico, steady and both slowly and quickly increasing car bomb use trajectories may exist. The prognosis for decreasing car bomb deployment appears unlikely. If cartel car bombs were to be deployed on U.S. soil or against U.S. personnel and facilities in Mexico, such as our consulates, we could expect that a pattern of indications and warnings (I&W) would be evident prior to such an attack(s). In that case, I&W would be drawn from precursor events such as grenade and improvised explosive device (IED) attacks (or attempted attacks) on our personnel and facilities and on evolving cartel car bomb deployment patterns in Mexico. The authors conclude with initial recommendations for U.S. Army and defense community support to the military and the federal, state, and local police agencies of the Mexican state, and the various U.S. federal, state, and local police agencies operating near the U.S.-Mexican border. The extent of support in intelligence, organization, training, and equipment is highlighted, as well as the extent that these forms of support should be implemented to counter cartel vehicle-borne IEDs and overall cartel threats.